The Hinterland of the Gold Coast is the largest protected area of subtropical rainforest in the world, with sizeable warm temperate rainforest and nearly all of Australia’s remaining Antarctic beech cool temperate rainforest. Here, massive Strangler Figs, ancient Antarctic beech, Red Cedar, Rosewood and Booyongs tower overhead whilst hundreds of different species of palms, vines, ferns and orchids flourish beneath. This is Gondwana Rainforest at its very best. The Gold Coast Hinterland walking trail starts in Lamington National Park and traverses a landscape at least as old as the dinosaurs, linking the World Heritage-listed Lamington and Springbrook plateaus. We have selected the most scenic tracks through this unspoilt rainforest – tracks that pass numerous cascading streams and towering waterfalls, crisscross creeks and present the most beautiful locations to bask, eat lunch and simply just relax. The walking is mesmerising up here, with peaks reaching over 1100m and the steep untracked southern edge forms an impressive natural border with the state of New South Wales. Highlights include walking the volcano rim, doing the Treetops walk and climbing the huge Strangler Fig tower. This walk is a true challenge as you traverse the Gold Coast Hinterland Great Walk from one end to the other as it winds its way through the mountains. However, it is paced to maximize time enjoying the natural scenery. Relax in the evenings at the unique and charming rainforest retreats and lodges. We offer this destination as either a 5-day (includes 3.5 days of walking) or 7-day (includes 5.5 days of walking) itinerary. Start at the Gold Coast airport in Coolangatta at 2pm (or earlier if you wish), with a transfer into the mountains. There is no walking scheduled for today but there are plenty of facilities to enjoy at the guesthouse and optional activities you can participate in. O’Reilly’s is renowned for its bird life with more than 160 species of sub-tropical birds breeding in this fertile area. The striking black and yellow Regent Bowerbird is a real highlight along with soaring wedge-tailed eagles, rosellas, lorikeets and cockatoos. Don’t miss the early morning guided bird walk each morning. Other regularly seen wildlife include red-necked pademelons, pygmy possums, sugar gliders, platypuses, bandicoots and wallabies, providing a true cornucopia of Australian native fauna. With no scheduled walking, you are best to take advantage of being right inside the park and explore the lodge surrounds. The morning walk is an excellent introduction to the unique flora and fauna of the area. The sheer size of the Gold Coast Hinterland and variety of flora makes the walking a remarkable experience. Hug the ‘Wishing Tree’ and walk to stunning Moran Falls. After lunch at the café, the afternoon walk criss-crosses pretty Canungra Creek. Walk through this lush sub-tropical rainforest with impressive stands of Brush Box and Piccabeen palms. Climb the giant fig tree and explore the different levels of the rainforest on the Tree Tops Walk. Finish the day with a soak in the heated outdoor spa pool. Today, you’ll walk across the rainforest plateau on the Border Track to Binna Burra Lodge. This is the longest section of the walk and follows the Border Track, and at 25 km it’s a long way but the route is reasonably flat and easy. The trek across the McPherson Range is sure to be a highlight for many. The Lamington plateau sections through the rainforest are punctuated by cascading streams, crystal-clear creeks, towering waterfalls and breath-taking lookouts offer delightful resting and lunch spots. A full day circuit walk from Binna Burra on the Daves Creek Circuit. The track emerges from the subtropical rainforest at several panoramic escarpment lookouts along the way. One of them takes you to the remote eastern escarpment for great views into the Numinbah Valley. There’s also an excellent optional side trip to spectacular Upper Ballanjui Falls. From the Numinbah, head uphill onto the Springbrook Plateau. Highlights include hiking alongside the Little Nerang River past waterfall after waterfall. At Warringa Pool you can enjoy a refreshing dip in a rainforest swimming hole before Purling Brook Falls takes your breath away. A circuit today, trekking on the Springbrook Plateau. The Warrie Circuit is a major highlight as it zigzags its way through a valley of waterfalls and canyons, criss-crossing the creeks and ending up at the Meeting-of-the-Waters. The climb out via Twin Falls is equally impressive. 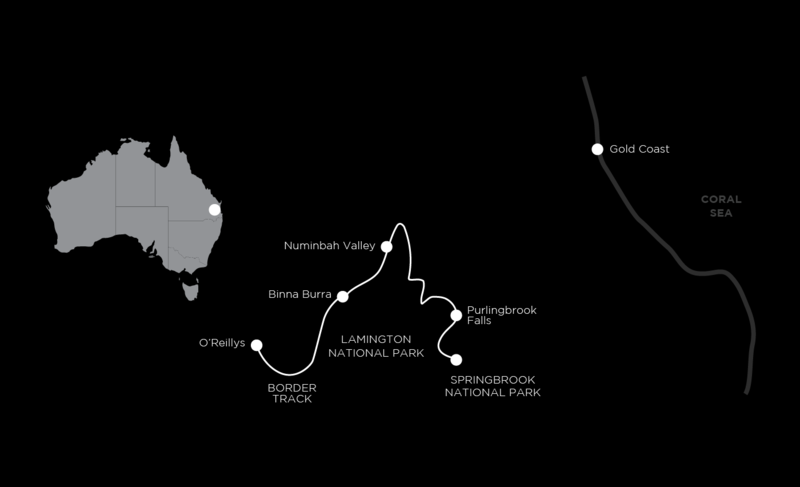 If you don’t want to go all the way, there’s a shorter option of the Twin Falls Circuit. After breakfast, you’ll be transported back to the Gold Coast airport in Coolangatta, to end this vacation. The Gold Coast hikes walks are mostly easy to negotiate and the tracks are well graded . Full day walks average about 16km. There are opportunities for fit walkers to challenge themselves on some of the days with rather lengthy walks of up to 25km. The accommodations are excellent on this walk, the superb Sky Lodges offer incredible views and the cabins built right over the Twin Falls Creek offer one of the most tranquil environments that you will experience anywhere. All the accommodations are within national park confines or in a beautiful natural setting. All the rooms have ensuites. The two course dinners in the restaurants are prepared by professional chefs, as are the cooked breakfasts. The Gold Coast Hinterland Walk connects the Lamington and Springbrook Plateaus together via the Numinbah Valley. You’ll generally progress in a west to east direction with some circuit walks ensuring you experience the best of this ancient and spectacular landscape. Starting and finishing on plateaus means there are some reasonably steep descents and gradual climbs. The highest point of the work is a little under 1200m above sea level. You can expect to walk on a variety of distinct, well-marked, well-maintained tracks. Some rough track surfaces have exposed roots, steep grades, sets of steps and creek crossings and require extra care. However, walking under the sun-dappled shade of the canopy is always delightful. You’ll be walking an average of about 15km each day, compared to the longer 25km day along the iconic Border Track. Mostly, you’ll walk in and out from your accommodation, meaning more time to enjoy the walk’s landscapes and scenery each day. We move your luggage ahead to your next accommodation at each stage, so all you need to carry is what you need for the day. Please Note: For larger group bookings, on your nights in the Sky Lodges at Binna Burra, not all the bedrooms will have views overlooking the Coomera & Numinbah Valleys. The Sky Lodges we allocate will have two or three bedrooms (each with their own ensuite bathroom) and large communal living areas which open up to a spacious decking area for you to enjoy the views on. With this in mind, the rooms with a view will be allocated to the bookings that are received first. You can view a floor plan for the three bedroom Sky Lodge here. We can also arrange private transfers from Gold Coast hotels. The cooler months of May to August are best as there is low humidity and the temperature is usually very pleasant for walking. It can be very warm and humid from September to November and again from March to April. Not available over the summer months of December to February.